Join the Gallery Home Furnishings Preferred Customer Club and not only will you receive a FREE SHOPPING PASS worth $50 off your next purchase of $499 or more but you will also be eligible for special sales and events exclusively for club members. Join now then check your email for your FREE SHOPPING PASS. Some exclusions apply. See below for details. Gallery Home Furnshings will periodically send emails notifying you of special events, sales, and discounts. If you don't want to receive these emails, simply click the "unsubscribe" button when you receive your shopping pass. 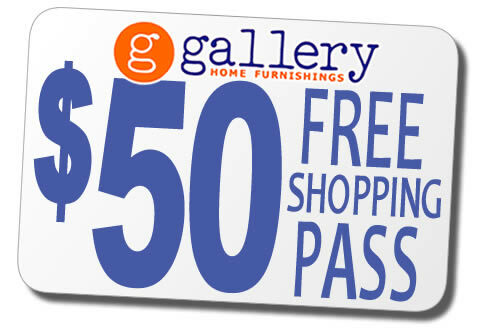 * The Shopping Pass is for new members of the Gallery Home Furnishings Preferred Customer Club and is valid for use on one purchase of $499 or more. It is not valid with some promotions, clearance items, or Tempur-Pedic mattresses. The card must be presented at time of purchase. See store for additional details.